Faster than a speeding bullet, more powerful than a locomotive, able to leap tall buildings in a single bound…look, up in the sky, it’s a bird, it’s a plane, it’s…Ben Affleck! In a couple of months, Zack Snyder’s Man of Steel will be released, and I’ve only recently decided that it’s the summer movie that I’m the most excited about (so far). Granted, I’m excited about quite a few of the movies due out in the next few months, but as the date grows nearer I find myself getting more and more anxious about The Man of Steel and hoping that it’s going to have more heart and substance than the rest of the comic book movies we’ve been served lately. I loved The Avengers and I think I’ve even come to terms with The Dark Knight Rises. But if done right, The Man of Steel could be different from what we’ve gotten from a superhero film because…well…Superman IS different. I’ve always marginally enjoyed the character of Superman; he’s a cultural icon, and you couldn’t grow up and not see him on lunchboxes, in the action figure aisle and on Saturday morning cartoons. But I was always more of a Batman guy, and even more of a Marvel Comics fan, so I’m as surprised as anyone to discover that Snyder’s Supes film is the one I’m most anticipating. There’s a lot of pressure on it. Pressure from the moviegoing public to show them something they haven’t seen from the Marvel movies or from Nolan’s Batman trilogy. There’s pressure from comic book fans that Snyder doesn’t eff it up. And there’s pressure from Warner Bros. because they screwed up Green Lantern and are going to have a hard time getting their plans for Justice League to work if no one likes Man of Steel. And they SHOULD be worried. It’s tough to tell a good Superman story, because not very much is able to physically hurt him apart from Kryptonite, and that’s been exploited so much that it’s lost all potency as a valid weakness. Brian Singer’s Superman Returns was all heart and no spectacle. As many people pointed out, Superman doesn’t even throw a punch in that movie; he just keeps getting attacked by kryptonite. Boooooring! No, the thing that makes Superman interesting is that to hurt him, you have to hurt those that he’s close to (and maybe make him fight giant spiders and polar bears). Superman stories usually have a lot more heart. He’s a man torn between two worlds, destined to live among us but never to be like us. A good Superman story uses that outsider vibe. Superman is the ultimate example of Joseph Campbell’s teachings on myth: a super-powered being sent from a dying society to Earth to protect us when we cannot protect ourselves, to offer us salvation where we cannot save ourselves. Of all the superheroes of the last 80 years, Superman is the one whose framework goes the farthest back and who is the truest interpretation of pure good. He is not a human doing good works; he is not of this world, but he chooses a life among us. Like Dennis Rodman (hey, he’s back in the news, so the Rodman jokes are back…hello, 1997!). Okay, look, I swear, I’m getting to Ben Affleck soon. You came for the Affleck, I’ll give you the Affleck. There have been many film and television adaptations of Superman over the years, probably more than any other comic book character. What’s interesting is that each one feels completely different and uses Superman in a unique way. For instance, the Fleischer cartoons of the '40s feel very different from the Adventures of Superman television series from the 1950s, which feels different from the Richard Donner movie starring Christopher Reeve. His powers have evolved and changed over time to the point that he’s practically immortal, but that wasn’t always the case. I’m pretty familiar with the Superman from the comics and the Christopher Reeve version of the character, as well as television’s Smallville, which gave us a very melodramatic, young, pre-Supes Clark Kent. But I had next to no exposure to the '50s television show The Adventures of Superman. I’ve decided to change that, and have spent time with the series recently in an attempt to fill out my Superman knowledge. The Adventures of Superman ran from 1951 to 1958 and starred George Reeves as Clark Kent/Superman. Reeves had been a working actor for 20 years, making his first credited appearance in Gone With The Wind. I’ve been pretty impressed with the show, but had no expectations of greatness. The show is what it is: a cheap, weekly television program with an extremely limited budget and very few resources. Reading about the production, I’ve discovered that the shows were shot back to back and sometimes scenes for as many as four separate episodes were filmed at once to utilize a certain location. The special effects are modest and often consist of little more than wires and rear projection on a sound stage. Still, I give the show a lot of credit for using those resources well and creatively, and I think the scripts are innocent and fun. Each episode has a vaguely ominous title, such as “The Haunted Lighthouse” or “The Man Who Could Read Minds.” It’s fantastical and the mysteries never turn out to be supernatural, but it’s enjoyable. 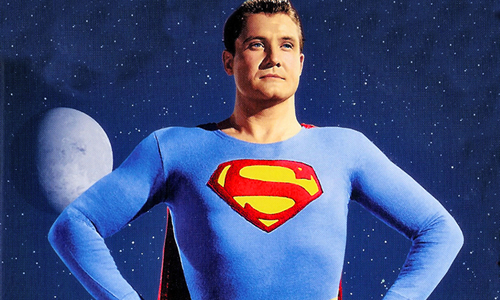 It’s completely harmless, and each week George Reeves gets to save the day in a new way. Reeves is great in the show. Decades before Christopher Reeve donned the cape, Reeves does a good job portraying Clark Kent as different from Superman. It’s not just the outfit; he plays them differently. It’s light years away from the career-defining performance that Reeve would give in Donner’s film, but it’s still a decent performance, and a lot of fun to watch. Also worth noting is that in these old shows, Superman doesn’t have the powers that Reeve’s Superman did. These are still the early days of Superman. The character was only about 12 years old when this show debuted, and Superman doesn’t fly, he just jumps really high. There’s no flying around the earth here. No drilling below the earth’s surface. This Superman is pretty straightforward: he jumps, runs really fast, is impervious to bullets, and can see through most substances (like the girls locker room wall, high five!). In some ways, the character is more interesting here because he’s more vulnerable. He can’t do EVERYTHING. And more often than not, the bad guys he faces (there are no super villains, only small time crooks) challenge him with battles of the mind, mysteries that must be solved, rather than kryptonite. But paying any sort of interest in the actor George Reeves inevitably leads down a dark road -- an ironic contrast from the heroism of his role on The Adventures of Superman. In 1959, the year after the cancellation of the show, Reeves put a gun to his head and committed suicide in his Hollywood home. Only, maybe he didn’t. Maybe it was an assassination, because he was mixed up with the wife of MGM manager Eddie Mannix. Or maybe that’s not what happened, either. Maybe it was an accident, resulting from a fight with his girlfriend, the very public socialite Leonore Lemmon (a '50s Paris Hilton). While the official story and cause of death is suicide, some questions remain unanswered. Speculation persists to this day that there was foul play involved. That’s the subject of Hollywoodland, the 2006 debut film from television director Allen Coulter. The movie stars Ben Affleck (look, I promise you Affleck, I give you Affleck) as George Reeves and Adrien Brody as Louis Slimo, the private investigator who is trying to find out the truth in the immediate aftermath of the tragedy. Because it’s set in 1959, it serves as a modern LA noir film, but with many scenes set in the orange, harsh sun of Hollywood. We see the seedy Los Angeles, the dive hotels and apartments. I first saw Hollywoodland upon its original release and enjoyed it, but wanted to revisit it with the appreciation I now have for The Adventures of Superman under my belt. The Reeves mystery is a really compelling story, and I was eager to watch it again. Not all of Hollywoodland works. It asks us to go to places that it’s not always able to take us, and as the director’s first film, it’s pretty flawed. But it does succeed in capturing 1959 and in establishing a mood. The score goes a long way; from the moment the film begins, there’s a slow, melancholy theme running throughout the movie that feels like a dirge. It instantly conveys the light and dark shades of old Hollywood: sunlight and darkness, glamour and heartache, fame and loneliness. Coulter also succeeds in conveying the cars, the fashion, and the lifestyle of '40s and '50s Hollywood in a way that I am surprised by in a 14 million dollar film by a first time director. You can smell the cigarettes and whiskey. Affleck’s George Reeves is a charming but flawed man who felt like work in serials, army films, commercials, and television shows paled in comparison to his major motion picture work. He felt like a failure because he couldn’t hold on to his film career. His story is intercut with the ongoing investigation by Brody’s Slimo, who is fast and slick, willing to do whatever it takes, even if that includes lying to his clients in order to make an extra buck. Brody is great. His performance seems effortless, and he has a magnetism that makes him easy to watch. He oozes '50s cool here, a lot like Elvis did in the movies I wrote about last week. I like him, and I like that the same man who won an Oscar for The Pianist was also in King Kong and Predators. He’s the best thing about this movie…maybe the ONLY good thing about this movie. Ben Affleck is not right for the role of George Reeves. He can sort of pass as the physical equivalent, but he just doesn’t fit. He seems to be working very hard here, and he’s out of his depth. 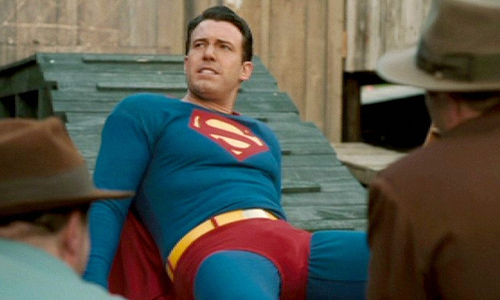 The performances I’ve seen in The Adventures of Superman are miles more interesting than what Affleck does here with the role. It’s interesting that we’ve discovered Affleck the director, the now multi-Academy Award winner, but here he just doesn’t feel believable. He feels like he’s still back in Chasing Amy or Phantoms (in which he was the bomb, yo). Part of it is that he is being asked to play a man who is about 15 years older than he actually is, and it doesn’t work. Diane Lane, as the wife of Eddie Mannix (Bob Hoskins) with whom Affleck falls in love, doesn’t really seem to fit either; she’s been made up to appear aged as well, and I just don’t buy it. She’s not given much to work with. Hollywoodland posits that George Reeves HATED being Superman and felt like he was trapped by the role, no longer taken seriously by the film community, and that this crushing disappointment that led to his suicide -- if the death WAS a suicide and not a murder or an accident. There were no scorch marks on his temples, indicating that the gun may have been fired from across the room. There were also bullet holes found in the floor. A good bit of this story seems to have been manufactured based on hearsay and speculation; those close to the real George Reeves insist that he loved being Superman and a hero to millions of children, and that while he did lament the end of his film career, he had come to terms with his role and as a legitimate television star. The film does not reflect this. It depicts him as bitter, depressed, lonely, and resentful of his television career, as a man too unambitious to make changes in his life that could lead to happiness. As Slimo delves deeper into his investigation, his own life starts to unravel. The movie does the best it can at giving us some sort of closure, given that there is still no definitive explanation of the real cause of death. In the end, the story is about Slimo, not George Reeves, and I suppose that’s a wise choice, especially when you’ve hired Ben Affleck as a dramatic lead. Hollywoodland is not a great movie. I’m not even sure it’s a very good movie, but I like Adrien Brody’s performance and think that it works well enough to warrant a viewing. It captures a time and place as well as a movie twice its size, and succeeds on atmosphere and mood. 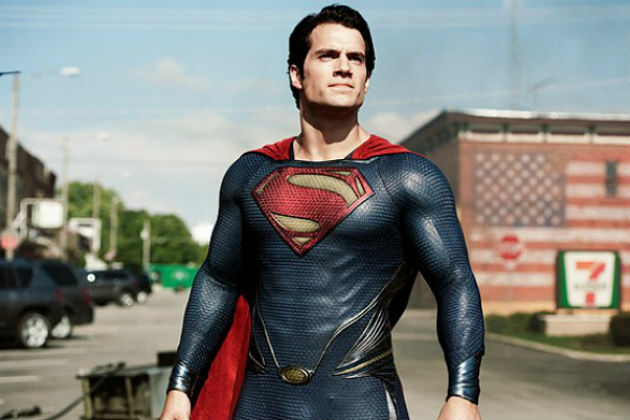 As we get closer to the premiere of Man of Steel, there’s going to be an increased interest in Superman. Should you find yourself wanting to learn more about George Reeves or Superman in the '50s, there are worse ways to spend two hours than watching Hollywoodland. For a dose of Affleck, you might be better off watching Forces of Nature instead. I think this column was just a backwards way of telling us you like Adrien Brody. 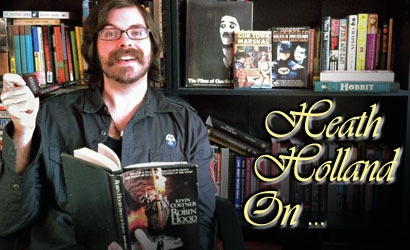 Fun read Hollywood! Oh, dude, I think you're right. I could have saved myself about 2000 words if I'd realized that before now. I could have just said "I like Superman! I can't wait for the new movie! And I think Adrien Brody is cool!" Seriously, though, even in the director's commentary of Hollywoodland, the director was talking about how impressed he was with Brody and how he did so many little things that made him interesting. He didn't say much about Ben Affleck. Just one correction: George Reeves' Superman does fly in "The Adventures of Superman", which has been the norm since the Fleischer cartoons made him fly (quickly adopted by the comics) a decade earlier. Typically, in the show, we first see the springboard take-off, either toward and through an open window, or toward and above camera. But once Superman is out of frame and the shot changes, Superman is flying in profile, body horizontal, cape fluttering in the wind, arms extended forward, legs extended backward, supported by any one of a handful of rear-projected backgrounds and a wind sound effect. When Superman begins a landing, the shot might change to a more straight-ahead angle briefly showing the beginning of a descent. And when the shot changes to the completion of the landing, there's the horizontal bar or ladder dismount landing into frame from out of frame, often through a window into a room. A lot of the takeoffs as shown would result in quick collisions with nearby buildings if they were just jumps, and a lot of the landings (particularly the ones through open windows) would have to be calculated with artillery precision if they were the results of jumps. Supes has been flying since the Kirk Alyn serials at least. Another thing... Superman had to be flying in the tv show. I remember watching the show when I was four and asking my Mom why they were showing episodes again and why didn't they make more. She told me that they couldn't because the actor who played the part started to believe he was Superman. He thought he could fly and jumped out a window (which was why it was bad to believe in fantasy too much). Which is better than telling a little kid that he shot himself, I guess. And I'd still like to know what Reeves' neighbors heard that night - or if anyone bothered to ask them. Alright, well, since it's been brought up THRICE, I'll explain myself. Yes, it looks like he's flying because he's all horizontal and stuff. But the opening credits say that he's able to leap tall buildings in a single bound. I was under the impression he was just jumping really far still, like the Hulk. I mean, we can get into physics and the ANGLE at which he jumps out of windows, but it's a 50s TV show. I guess I was wrong. Or I just assumed something that wasn't true. And since this is a 50s show with practically zero budget, most of what we see is Superman jumping out of frame and then we cut to a horizontal shot. Then he jumps back into a frame again. All that to say...my bad. Superman had (has?) a lot of catch phrases. Ones that they wanted to use in the TV show. At one time, Superman did just leap long distances. But that was also when Clark Kent was raised in an orphanage after arriving on Earth. It was the last couple of Fleischer cartoons where he was flying after Jay Norton penned the phrase, "Look! Up in the sky! It's a bird! It's a plane! It's Superman!" for the cartoon. But I'm still kind of confused that you didn't know he flew in the show after seeing Hollywoodland and that scene where they're trying to have him fly on wires and he falls hard. Reeves refused to do that and that's why the springboard trick like in those old Commander Cody serials. And it was a kid's show after all. It didn't have to have it's physics letter perfect.